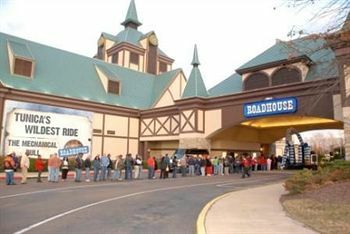 Tunica Roadhouse Casino & Hotel, Formerly Sheraton Casino and Hotel, is located in Tunica, MS. Pull up a chair at our 36 red-hot table games including blackjack, craps, roulette, Caribbean Stud, Let It Ride Bonus, three-card and four-card poker, Deuces Wild, World Series of Poker Texas Hold 'Em, and Flop Poker. At Tunica Roadhouse Casino & Hotel, we pride ourselves on having the newest and hottest slots in town! From pennies to high dollar machines, there's something for every slot enthusiast. You'll love our innovative slot floor featuring Tunica's finest and largest selection of reel and video slots including Wheel of Fortune Special Edition SuperSpin, Mr. Cashman, Elvis and Double Diamond. Plus, we have all of your favorite classics like Caveman Keno and 4-card Keno. We have more than 1,000 slots, in every denomination!